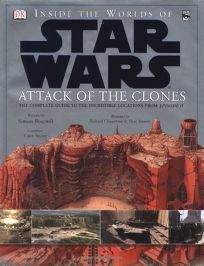 The movie tie-ins to the Star Wars saga continue with Inside the Worlds of Star Wars: Attack of the Clones: The Complete Guide to the Incredible Locations from Episode II by Simon Beecroft, illus. by Richard Chasemore and Hans Jenssen, exploring alien terrain in maps, cross-sections and stills from the movie. Text and artwork offer detailed depictions of landscapes, cities, palaces, and the cultures and politics of the inhabitants, as well as trace Anakin's key routes via swoop bike, plus the routes of Padme's starship and the Tusken Raiders.